Killer Characters: Do Bad Feelings Have A Name? Do Bad Feelings Have A Name? My human, Charlotte Bessette, has been very sad lately. Her cousin Matthew and his twin girls and my pal Rocket (the French Briard) moved out of the house after Matthew got married, and it's been very quiet here. Of course, Charlotte doesn't like to be idle and she refuses to be sad for long. She has tons of things she has to fix in the old Victorian home she owns, so she's started in on her to-do list. She's turned the office upside down. She took away my nice soft carpet and covered my comfy chairs and all the floors with hard blankets. She calls them tarps. She moved the old desk into the garage, and big surprise, she found some paper in a secret drawer. She started crying the moment she found the paper. She calls them letters. She said if she spent too much time reading them, she wouldn't get anything done, so she stored them in a box that burps. She calls it Tupperware. She lets me watch as she sands the table. I don't like the sound of the sander, but I like watching her when she's quietly buffing one of the legs of the desk. It was an ugly brown color. Painted with icky paint, she told me. It has to come off. Then she's going to make the desk pretty and natural, just like me. She's also invited a woman to stay in the house. A friend of Matthew's. A sommelier, whatever that is. I think it has to do with wine. She's very nice. I met her. I really liked her boots. I nosed them and the woman said I was the cutest thing ever. However, I have a bad feeling about her coming to visit. I'm not sure what the feeling is. But it's something. Do you ever get a bad feeling about something but you can't quite put a name to it? 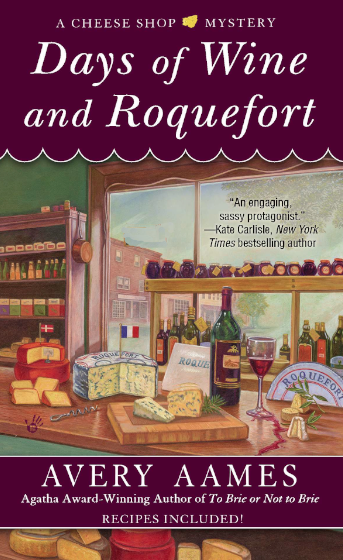 As part of Killer Characters' "Season's Readings," I'll be picking a winner to receive A CHEESE SHOP MYSTERY - your choice! Please leave your email address with your comment. PS From Rags: The rest of my story will be told in February. But I also want you to know about another story. My Facebook friend, Tigger—he's a ginger cat and lives in Crystal Cove, California with his human, Jenna Hart; she runs a culinary bookshop and café—he has a story to tell in March. Check it out. I always thought that everyone at some time or other has a bad feeling about something ---and, I do believe that you should listen to your instinct! Thanks for thinking of us! 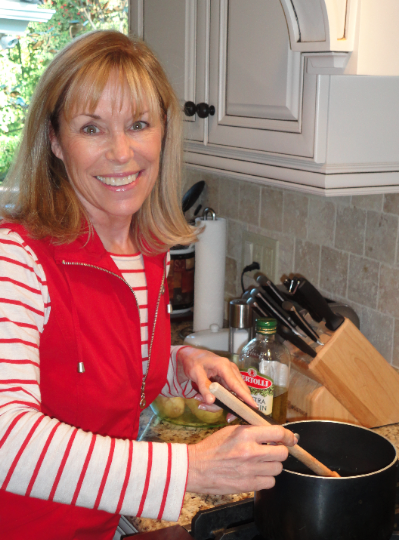 Lynn, thanks for chiming in! Listen to your instinct. Yes, I agree. Absolutely I get bad feelings! However, I think animals are more instinctive than people and we should pay more attention to their reactions than we do. G-J, I like your style of thinking. Yes, of course! It's like all my senses go on alert and I don't want to move. Oh, but Karen, you have to move. To avoid danger. I agree that most everyone has a bad feeling about something at one time. For me, it has been about person I knew I shouldn't date. I agree that you should always go with your gut feelings. garczynski (at) aol (dot) com. Hi, b-mom. Thanks for sharing. Aw, Dianne B, so sorry. But maybe not going on the cruise was for the best. Who knows what else might have happened. Hope you got to read a good book at home. I agree that animals are more intuitive, but I've had the bad feeling before too. My Granny had a real gift for it. She always knew when one of her kids was in trouble - no matter how far away there were. Ooohhh, I wonder why Rags has a bad feeling! Uh oh! And yes, I have had that bad feeling that I couldn't explain before. I woke up in the middle of the night last week and emailed my daughter to check on her...at 3:30 am. She was sleeping and safe and didn't respond until 5:30 am. I, however, didn't sleep well until after she responded. 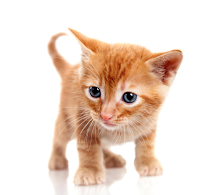 By the way, Rags, you are my FAVORITE breed of cat!! I have been trying for three years to persuade the male human in the house that we can't live without one of you. I am not giving up! Patricia (typing one handed), my breed is a very wonderful breed. We are loving and devoted and we can drape across your shoulders to sleep. Charlotte finds that comforting. Thanks. I hope you've met my new friend, Tigger, then. 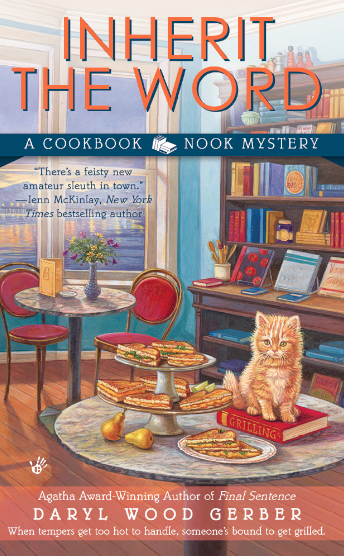 He's in The Cookbook Nook mysteries and he is adored by his human, Jenna. Aw, Carol B, nicest words every. So glad you're loving my stories. Ooops, I mean, Charlotte's stories. Thanks, Libby. 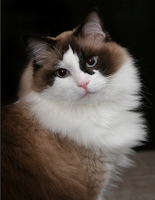 He looks just like the Ragdoll of a friend of mine. A very handsome breed. Your book sounds interesting! I'm new to this website (have lost my mystery connections since losing Google Reader:( I look forward to reading more! Welcome, Ann! Hope you'll stop by every day. We have new authors, new characters daily! It's a ton of fun. Some of my best friends show up and share their concerns. I think everyone has a bad feeling about something at least once. Yes, and when I feel uneasy about something I don't do it. PoCoKat, you don't take the risk? I wish you'd tell my human about that. She takes risks, but only when someone she loves is involved. Everyone has bad, or rather, foreboding feelings at one time or another. I love the itty bitty kitty, Tigger. 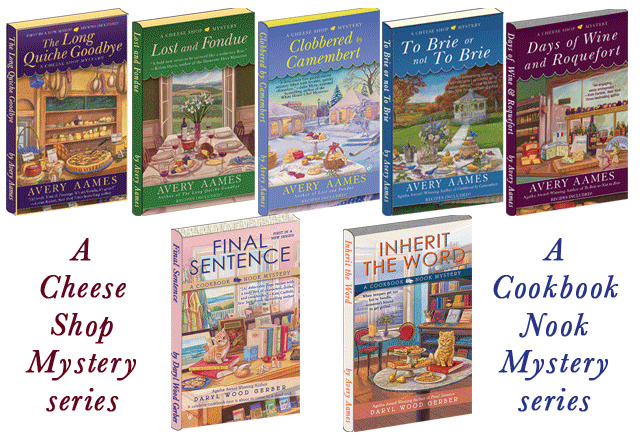 "As part of Killer Characters' "Season's Readings," I'll be picking a winner to receive A CHEESE SHOP MYSTERY - your choice!" Laura, thanks for giving a shootout to my pal, Tigger. Rags, I get that bad feeling all the time. I call it a hangover. Take some catnip and call me in the morning. Best of luck! Dorothy, ha-ha. Catnip. Will do. What's your number? That has happened to me often. Sometimes I don't listen to my feelings when I should have. One time we were in a store and I wanted to leave. Something just didn't feel right to me but my husband wouldn't go. Then the store was robbed and his walled was taken! Yipes, Carol, that sounds scary. I definitely wouldn't go to that store again. Yes, I get bad feelings about things. Sometimes, it comes to pass - but, usually, nothing comes of it. I think I have a bit of a pessimistic nature and think the worst. And yet, at the same time, I know everything will turn out ok. I will be interested in how the feeling Rags has turns out. Donna, I don't like to think I'm pessimistic. How about optimistic with a good gut instinct? :) I'll let everyone know how this turns out, okay? Yes, Rags, I do sometimes get bad feelings about things. I look forward to hearing more of your story-and Tiggers as well!! Thanks, Kat! It seems we're all in this together, doesn't it? 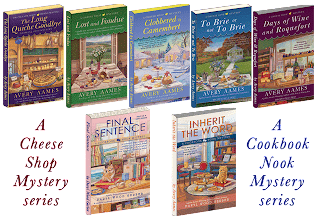 Well I am a big fan of mystery books, especially cozy ones and yes I have experienced that feeling that something is not quite right. I have to confess when I am reading a book, and really getting into it sometimes I have said out loud "no, don't go in there!" My family laughs at me but hey, what do you except from an avid mystery reader? Linda, I've done the same. Don't go in there. Turn on the light! Of course, humans don't seem to be able to hear me. Go figure. Our barn cats always seem to be good judges of character - I am sure you are the same. Susie, I like barn cats. I've met quite a few. I have gotten bad feelings and sometimes they turn out right but mostly they are wrong. Maureen, well, that's good to know. Maybe bad feelings are just that. Premonitions that don't come to pass. Here's hoping. Yes, occasionally I get a sense of foreboding but in my case it's only a touch of paranoia. Rather than having to rely on my oblivious gut to preclude negative things from happening, I sometimes feel as though I'm being protected by an unseen force ... fate, if you will, making me a few minutes late by creating a run in a stocking so that I'm not the one who gets rear-ended on the freeway. On the other hand, I do get GOOD feelings about some things and trust those instincts (e.g., flying cross-country to visit a person with whom I'd only interacted via Internet/phone and being positive that I'd return safely home). Katherine, wow, you did that? You met someone cross country? Wow! That would scare me to pieces. And yet, I did like Charlotte the moment I set eyes on her. Tigger felt the same way about Jenna. Marie, don't feel paranoid. I think it is natural, based upon all the things I've read today. My teens would call me lame but I LOVE a book with a cat in it. Yep, and when I ignore that feeling, it invariably comes back to bite me. I have learn to take notice when I get that feeling. Oh I absolutely have had a bad feeling about certain situations. And often it's proved true. I have gotten "a bad feeling" about situations or people before. I do believe in the sixth sense. I have had bad feelings about certain situations in the past. This is probably because it just isn’t a good idea and it’s hard to change someone else’s mind. Therefore, you go with it and hope for the best!